The British anthropologist Jane Goodall has said that we need plants “in some deep psychological sense.” However, keeping plants alive is not always an easy task, and not everyone has a green thumb. Even if you don’t have a lot of time for gardening, however, you can still grow low-maintenance houseplants. 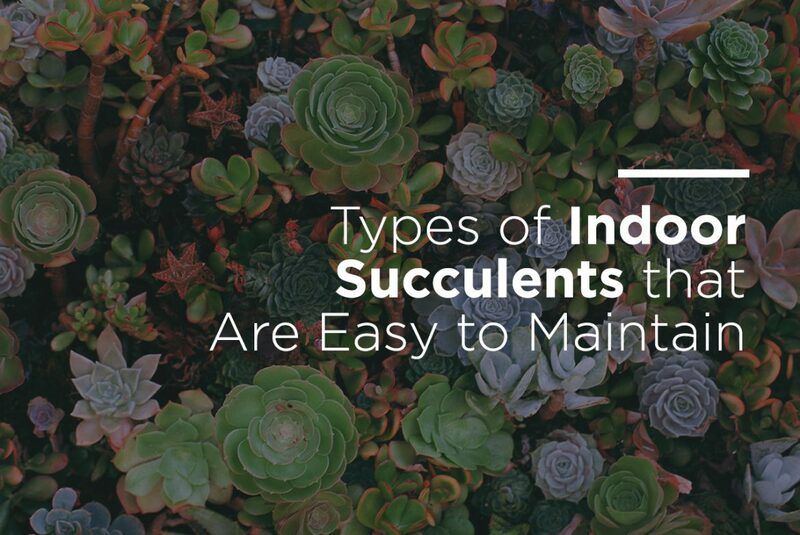 Consider trying your hand at growing one of these easy-to-maintain indoor succulents. Formally known as Senecio radicans, this trailing, fast-growing, succulent houseplant is native to South Africa. It is called “string of bananas” because of its unusual tendrils of small, banana-shaped foliage, which have a glossy appearance. The plant’s pointed leaves are partly translucent and grow along the cascading stems. Best of all, Senecio radicans gives bloom to clusters of tiny yellow, lavender, and white flowers in the fall and winter that let off a delightful fragrance similar to that of sweet cinnamon. An excellent plant for novices, the string of bananas is easy to grow and hardy, but it is toxic if ingested, so you will want to keep it out of the reach of young children and pets. • Plant Senecio radicans in porous soil with good drainage and then water whenever the soil is dry to your touch. • Pot with other indoor succulents. • Position in filtered sunlight. • Prune regularly to ensure that the plant grows full and thick. Sansevieria trifasciata, also known as “snake plant” or “mother-in-law’s tongue,” is an incredibly low-maintenance house plant that can flourish even in dark corners. The plant boasts stiff, dark green leaves with green-gray cross banding that grow upwards from a basal rosette. • Place in indirect sunlight. • Water moderately and allow the plant to dry out somewhat between waterings. • Use a little general-purpose fertilizer in the pot. • Propagate your snake plant using cuttings. According to the U.S. Department of Agriculture, though not native to the U.S., the Aloe vera plant was introduced to two states: Texas and Florida. This medicinal plant is believed to have originated in Africa, specifically in Sudan. It flourishes in arid climates, and for centuries the sap has been used to treat wounds and sunburns. The thick fleshy leaves of the Aloe vera plant have a gray-green coloring, and white flecks sometimes accent the stem surfaces. Watch out for the sharp thorns along the edges of the leaves, however, as they can potentially cut you. For this reason, it’s essential to place your Aloe vera plant where you’re not likely to accidentally brush up against it. • Position in a location where the plant will receive at least two hours of sunlight each day. • Be sure to let the soil dry out between waterings. • Fertilize during the growing season but not in winter. • Keep your plant in its original plot and don’t attempt to move it unless necessary (i.e., if the roots begin to come out of the pot). Sedum morganianum, more colloquially known as “burro’s tail” or “donkey’s tail,” is native to Honduras and southern Mexico. This perennial produces unique, blue-green trailing stems that give rise to red and pink flowers in the summer. • Plant in a hanging basket to allow space for the fast-trailing stems. • Place in an area where the plant will receive bright sunlight. • Keep the soil somewhat dry in winter and let it dry out between waterings. • To prevent leaves from falling off, situate your plant in a safe space where it will not be regularly bumped or touched. Better Homes and Gardens suggests that if a piece does break off, however, you should root it to start a new plant. Crown of thorns is an evergreen succulent plant so named for the unique appearance of its spiky branches, which makes it resemble the crown of thorns worn by Jesus at his Crucifixion. It is also known as the Christ plant or Christ thorn. Though it originated in Madagascar, the Euphorbia Milli species was introduced to France in 1826 by Baron Milius, one-time Governor of Réunion. • The plant’s watering needs are somewhat moderate. Nevertheless, do not allow the entire pot to dry out or your crown of thorns will begin to drop its leaves. • Use a balanced fertilizer two or three times throughout the growing season. Native to North Africa and southern Europe, hens-and-chicks is known as hens-and-biddies in the American South. The central plant is referred to as the “hen,” while the “chicks” are the offspring that begin as mere buds before sprouting roots of their own. • Position in a bright spot or light shade if necessary. • Allow the plants to dry between waterings. Don’t overwater, or rotting may result. Water only occasionally during the winter if you are growing the plant in a colder region. The Haworthia fasciata, or zebra cactus, earns its name from the bumpy white stripes that line its pointy, triangular-shaped green leaves, which grow in thick clusters. Native to the African continent, the plant is prevalent in the Eastern Cape of South Africa. The zebra cactus has the advantage of looking beautiful while requiring limited care and taking up very little space. • The roots of the zebra cactus do not deeply penetrate, so be sure to use a shallow pot and repot the plant every one or two years using a succulent potting mix. • To prevent shriveling, do not expose the plant to direct sunlight, but place in a well-lit area in your house. Known as Beaucarnea recurvata, or ponytail palm, this succulent is a favorite among large houseplants because of its drought-tolerant and slow-growing nature. It also earns the name of “elephant’s foot” from its water-swollen stem base. Native to eastern Mexico, the plant is not closely related to real palms, but it does resemble them in appearance. The Royal Horticultural Society has bestowed upon the ponytail palm its Award of Garden Merit. • Although the plant can grow in full sun to light shade, it is best to position it in a sunny spot where it will receive bright but indirect sunlight. • Do not water regularly as overwatering can foster pests. Allow the topsoil to dry completely between waterings. Brazil’s southeastern coastal mountains are home to Schlumbergera x buckleyi, which grow on rocks or trees in shady and humid conditions. They are also native to Texas, Oklahoma, Arizona, and New Mexico. The plants are called Christmas cacti in the Northern Hemisphere because, as Mick Telkamp of HGTV writes, “around Christmas, something magical happens”: the plant gives bloom to pink, yellow, orange, red, white, or purple flowers. Blooms last one to two weeks, but the Christmas cactus is beautiful even without its flowers, a fact that makes it one of the most popular houseplants. If properly cared for, Christmas cacti can last two or three decades and give bloom to flowers each year. • Keep the top inch or two of soil dry between waterings and keep the plant a little drier in the winter, when overwatering can result in buds dropping. • Too much light will discolor stems, while too little may prevent flowering. Give your Christmas cactus the “Goldilocks’ treatment” by positioning it between extremes of light. • For best results, keep your house around seventy degrees and place a tray of pebbles and water beneath the cactus for added humidity.